Editor's Note: The IRRC is honored to feature Dr. Amy Hutchison, Associate Professor at Iowa State University, and Lindsay Woodward, Assistant Professor at Drake University, as guest authors in the following blog post. Technology is common in 21st century literacy classrooms. However, the types of technology and the purposes for its use can vary greatly among grades and teachers. There are two important considerations for using technology in today’s classrooms. First, we need to understand the goals for including technology in literacy instruction. Second, we need to know how to design instruction to support students in achieving those instructional goals. This blog will address both of these issues. Why Use Technology in Literacy Instruction? There is a growing body of research that supports using technology to transform students’ literacy learning and make lessons more impactful (Barone & Wright, 2008; Dalton, 2012; Hutchison & Colwell, 2014; Hutchison & Woodward, 2014b). However, the need for integration also comes directly from students’ own digital practices and the curricular standards being used in classrooms today. For example, a recent study of over 1,200 fifth grade students explored the many different types of digital tools they used, both in and out of the classroom, as well as the purposes for which they were using technology (Hutchison, Woodward & Colwell, under review). The results indicated that students used technology differently when they were in school versus out of school. In school, they were engaged in activities such as creating documents and graphic organizers. Out of school, they used tools such as social media and chatting with others online. Not only are students using digital tools in and out of classrooms for multiple purposes, but they also are expected to develop a sophisticated understanding of how and when to use digital tools in order to meet learning standards. The Common Core State Standards Initiative describes students who are able to “employ technology thoughtfully to enhance their reading, writing, speaking, listening, and language use…They are familiar with the strengths and limitations of various technological tools and mediums and can select and use those best suited to their communication goals” (National Governors Association Center for Best Practices & Council of Chief State School Officers, They Use Technology section, para. 7). These expectations are reflected in the Iowa Core in each discipline as well as throughout the 21st Century Skills strand. Clearly, there is a need for students to be knowledgeable about a wide variety of purposes for technology—not only to meet standards-based instructional goals, but also to be college and career ready. 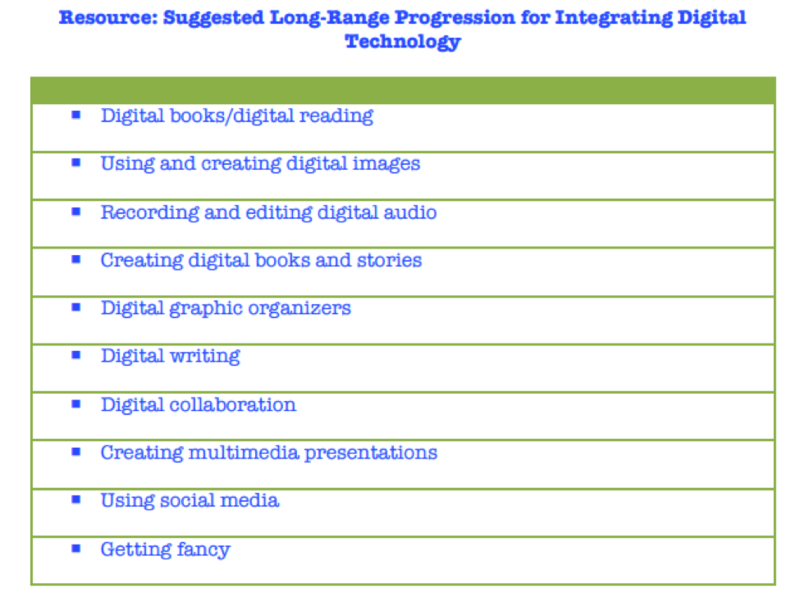 How Can Teachers Plan to Integrate Technology? Teachers can foster students’ ability to select and use specific digital tools to communicate with others by offering opportunities to use a variety of digital tools to meet specific classroom learning objectives. Tying the use of technology to specific learning goals allows students to understand the affordances and constraints of a tool as they are using it to master specific content. This type of literacy learning can help students make informed decisions about which tools might be suited to their needs in other lessons or contexts. Planning high-quality literacy instruction using appropriate technology involves the intersection of the teacher’s technological, pedagogical, and content knowledge or TPACK (Mishra & Koehler, 2006). For literacy teachers, this also involves knowledge about relevant literacy content and the appropriate use of digital tools for literacy learning. However, we have found that it is often difficult for teachers to know how to draw meaningfully on their TPACK when planning a literacy or language arts lesson. Therefore, we frequently use the Technology Integration Planning Cycle (TIPC) as depicted in the figure (Hutchison & Woodward, 2014a, p. 459). 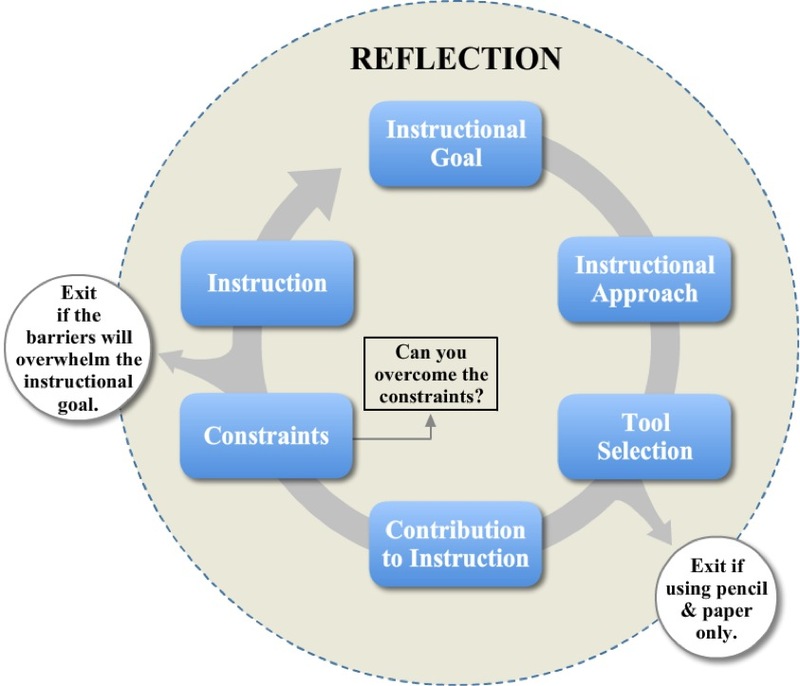 By outlining a clear cycle of elements for instructional planning, teachers are better able to confirm their instructional goals, identify their purpose for using technology is in meeting that instructional goal, and anticipate how to alter their instruction in order to maximize student learning. This cycle can support teachers who have a variety of experiences and beliefs about technology. For teachers who are already comfortable with using technology, applying the TIPC can make them more aware of the digital skills they are teaching and how these can add standards to the literacy instructional goal. For teachers new to using technology in meaningful ways, the TIPC guides them in carefully considering which tools might be most appropriate for accomplishing the instructional goal and building students’ digital skills. How Can Teachers Get Started with High Quality Literacy Instruction Using Technology? Teachers frequently ask us how they can get started with thinking about technology and planning literacy lessons in the way that the TIPC suggests. We believe it is helpful to have not only the literacy content standards in mind, but also a long-range plan for integrating digital technology. This way, teachers’ selection of a digital tool is based on its appropriateness for the instructional goal and for building students’ digital skills throughout the year. A sample long-range progression of digital skills is shown below and highlights how digital skills might be organized to scaffold instruction throughout the year (Hutchison, 2014, Using the Cycle and Long-Range Plan section). Thoughtful integration of technology and literacy is critical, regardless of whether a teacher is an expert with many digital tools or just beginning to explore how to incorporate them into lessons. By giving students multiple opportunities to use different types of digital tools as they accomplish a variety of instructional goals, they will be better prepared to use those tools independently for their communication activities in and out of school. Hutchison, A., Woodward, L., & Colwell, J. (Under Review). What are Preadolescent Readers doing online? An examination of upper elementary students’ reading, writing, and communication in digital spaces.